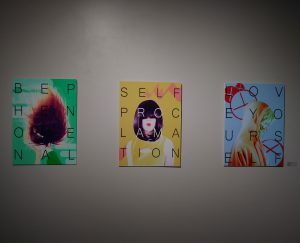 It is a new semester at the Clearwater Campus Crossroads Gallery, with a new exhibition that will have the viewer asking what illusions we are seeing in the ones we love or in ourselves. I encourage everyone to stop in and check out the exhibition Illusions to really experience the expression each artist has on display. Most of the artists have gone above and beyond to show everyone a very powerful message. Here are a few highlights and my armature photography of some amazing works of art. 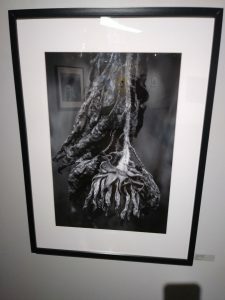 As the viewer enters the gallery the photography on the right are black and white inkjet print with powerful messages that can be found in the title of the image. 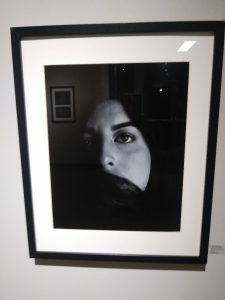 The first photo Selective Mutism by Amanda Weiss starts the journey of illusions in this exhibition showing amazing lines and contrast in the black and white print. There is a series of three very moving photos after this one, including a mouth sown shut that takes the viewers breath away. As the viewer enters the next portion of the gallery, a number of pieces displaying images created in a process called Wet Plate Collodion Ambrotype capture the imagination. The process is very labor intensive but the outcome is remarkable and forces the viewer to wonder what in year the photo was taken. 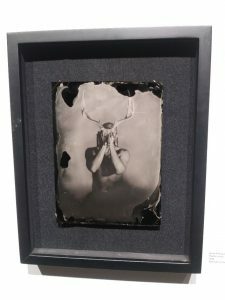 One of my favorites out of the group is The Becoming by Jamie Rodriguez because the photo has a folklore type of feel showing the scull of a stag covering a mans face. Produced in 2018, the series of photos tell a story altogether but each photo is really remarkable in the sense of how each one seems to be from another era. Once the viewer moves further around to the right of the gallery a number of different photos reveal themselves showing the amazing talent of each student. The piece Breaking Out by Skye Brumley will make the viewer stop for a moment to try and find an image that supersedes the rest, but this task is very difficult as so many images appear. At first one may just see a face in the photo but once the viewer takes a step back it looks like a person may be in the background as well. 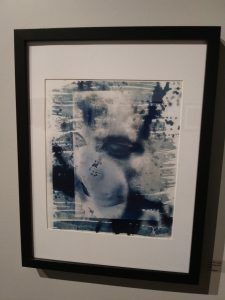 This piece has been produced through the fine art of Cyanotype which would allow the artist to apply multiple negatives to the print before the chemical bath process. The end result is a great illusion of multiple people in the photo. Moving past the series by Jamie Rodriguez and over to the left side of the gallery, the viewer is immersed in nature. Taking photos of flowers and nature is a personal hobby of my own, so the next photo was very beautifully sad to me, in black and white inkjet print. The photo Organic Beauty by Bonnie Simmons captures what looks like the death of the flower as it has dried out. The contrast of the black and white brings out the little hairs on the flower and so many beautiful details. Defiantly a must see in person. As the viewer turns around in the fishbowl like area of the gallery, one would see another piece displaying nature at her best. At first glance, the photo almost looks like an aerial view of a town with trees growing around the homes. If the viewer moves in for a closer view, the feeling of holding a camera to take the photo may enter the mind. This photo is so amazing because the viewer has to step back and use a bit of imagination to see the rest of the tree. 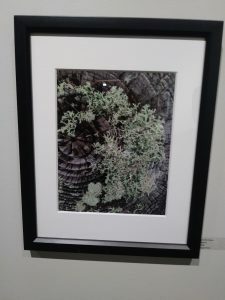 In the photo Reborn by Jennifer Denis, the viewer gets to see an awesome perspective of moss growing out of what looks like a tree trunk up close. The experience of an illusion is very present in this photo when viewing it in person. After leaving the fishbowl like area of the gallery the viewer will experience a three-piece series with some beautiful messages displayed. Very full of color and showing a positive affluence of self empowering messages. The last area of the gallery for my journey has, what may be called ‘taboo’, photos and prints that may cause the viewer to feel uneasy. 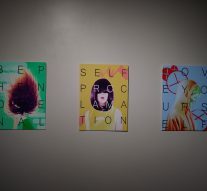 The series Untitled by Emily Thompson has been centrally located in the gallery, in my opinion, to bring the positivity back to the viewer after a journey of emotions. As the viewer enters the last portion of the gallery (on the right-hand side when walking into the gallery) some unsettling images are shown of what a lot of our military faces after war. In a series of five Inkjet prints, J. Joshua Bigham’s piece, “22” is a tear-jerking embodiment of the emotional and personal struggles our military personnel deals with every day. Bigham’s self-portraits thoroughly portray the struggles some of his close friends and he himself have had to deal with after serving. 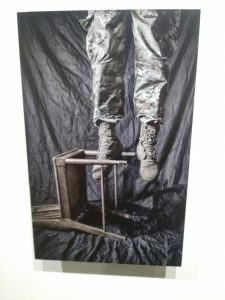 This piece inspired me to write about the exhibition because it is so full of emotion and it is shinning the light on a side of our soldiers that is painful but extremely important. The artist has a short explanation of his photos and his message to the viewer with the photos that I encourage everyone to stop and read. The fact that he has had over thirteen fellow soldiers commit suicide is beyond alarming and I agree with the artist in hoping to raise awareness and bring these tragedies to an end. The photo in the middle of the five was, and still is, the most chilling and emotional of the set. This is a must see in person to completely experience the artwork.